In this competitive business environment, if your company is not outsourcing, you are definitely losing a chance to lower costs and increased productivity. Outsourcing is one of the best steps that your company can take, as it can help solve most of your business problems and put your company ahead of competitors. Do not let your fears about data security, confidentiality, outsourcing processes, or the technology used stop you from outsourcing. Familiarizing yourself with the way outsourcing works can put your mind at ease and allay your concerns. Here are some common questions that most customers ask us when approaching us for a service. 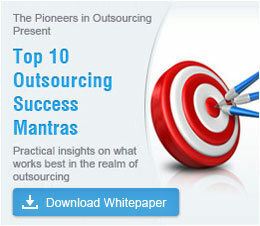 Outsource2india is an Indian service provider, operating out of Bangalore, India. We started our company in the year 2002 and initially offered only software development services. Today, we offer almost every imaginable service, from customer support to CAD conversion to web analytics to transcription; we are a one-stop destination for any business process that you wish to outsource. For the past 20 years, we have successfully served more than 11190 customers in over 221 countries across the world. Q: What services can I outsource to O2I? Q: Can I cut down on my operational costs by outsourcing to Outsource2india? Yes. By teaming with us, you can reduce your current operating expenses by a whopping 40–65% without compromising on quality or timelines. In fact, you will soon see a marked increase in your ROI, as our services are accurate, are of impeccable quality, and are always delivered ahead of schedule. If required, we can also provide you with an overview of the cost of your project. Q: What are the phases that an outsourced project goes through? Free trial period: This is an optional step. Our free no-risk trial will help you evaluate our performance and mitigate your outsourcing risks. It will also give you a better picture of how outsourcing actually works. At the end of the free trial period, you can decide whether you want to outsource your entire project to Outsource2india. Project transition: At Outsource2india, we follow a unique Process Knowledge Transfer Methodology, which ensures the smooth transition of your project to our in-house team. Our team will start working on your project only when they fully understand all your business requirements. Read more about our project transition process. On-going project management: During the course of the project, we will give you regular status updates. One of our experienced project managers will head the team at our office and manage every step of the project. At any given time, you can contact our project manager to find out how your work is being carried out. Customer review and feedback: You can closely monitor the progress of your project and voice your concerns or provide feedback, whenever necessary. Q: Will my business-sensitive data remain secure? At the onset of every project, we sign a non-disclosure agreement with the client, and our employees must sign a non-disclosure agreement as well. Our security team has installed virtual private networks (VPNs) and firewalls to maintain outbound and inbound data security. All the PC workstations that our employees use are devoid of external access and storage devices, such as USB ports, CD drives and floppy drives. Every system in our office and every employee email account is password-protected to prevent any unauthorized use of data. In case of a fire, no data will be lost, as we backup important documents in an offsite storage facility. We use fireproof cabinets within our offices for added safety. Our IT security team regularly installs the latest anti-virus software and updates to guard our servers. All our offices are guarded by 24/7 armed security. Only employees with access cards can enter our premises. Surveillance cameras in our office premises are constantly monitored to ensure that client assets always remain secure. Q: How will communication take place between us? As our customer, you will not encounter any language barriers, as all communication about your project will take place in English only. All our employees are fluent in spoken and written English. You can choose any communication channel that best suits you—phone, email or chat. Q: How can I be assured of high quality in my project? We have a specially designed workflow along with highly qualified QA professionals whose aim is to deliver only premium quality services. You can test and verify the quality of our work throughout the course of the project. Q: Are your employees experienced, certified and qualified? At Outsource2india, we firmly believe in delivering quality services, so we hire only the best people. All our employees hold bachelor's or master's degrees from reputed institutions, in business, engineering, computer science, commerce or the arts, and have a minimum of 2 to 5 years of experience. For services that require a particular skill or expertise in software, we ensure that we hire certified candidates who have undergone specific and relevant training. Our employees constantly upgrade their skills and knowledge through seminars and meetings. Q: Do you use the latest and best in infrastructure and technology? Yes. At Outsource2india, we make no compromises when it comes to the technology, software, and infrastructure that we use. We utilize the best in internet connectivity. Our network features include firewalls, advanced VPN communications, virus prevention/ cure, spam filers and URL filtering. We also have 100% redundancy and a fool-proof business continuity plan. Read more about our best-of-breed infrastructure. Q: Does Outsource2india possess long-term viability? Yes, we consider our long-term viability to be excellent. You need not have any reservations about teaming up with us, as we are completely debt-free. To ensure our viability, we always make it a point to sign outsourcing contracts or agreements. Q: How are completed contracts or work orders signed off? Once the project is completed, we will provide you with a work order form that you have to fill in and sign. Once this is done, you can either fax or email a copy to us. Q: What modes of payment do you accept? Once the project is completed and you are satisfied with the results, you can pay us either by wire transfer or by check. In case you wish to pay us through any other method, you can let our customer support team know, and they will guide you appropriately. Q: What makes Outsource2india unique? Our years of experience in outsourcing, combined with our low operating cost, flexibility, expertise, reliability, and integrity make us the best in the offshore market. Q: How can I benefit by working with Outsource2india? At Outsource2india, we can assure you that your project will be completed on schedule, within budget and in accordance with international quality standards. Contact us now to get started on outsourcing.